Nigel’s review of some stylish and functional heli-yachting helicopters has just been published in the India Edition of Asia Pacific Boating. 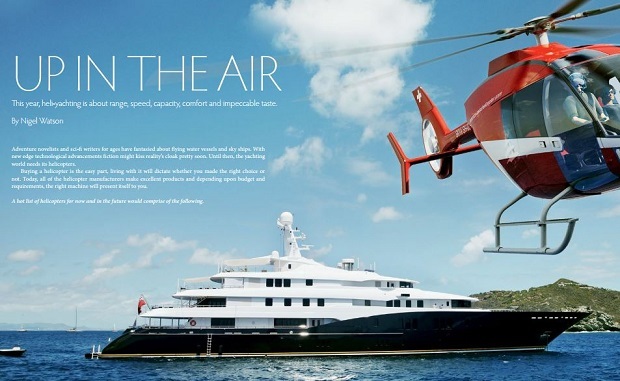 The ‘Up In The Air’ article highlights the key characteristics of a wide range of popular heliyachting aircraft: the Marenco Swiss Helicopter SKYe SH09, the Bell Helicopter Textron Bell 429, Agusta Westland’s AW 139 and AW 169, The Robinson R66, and the Airbus Helicopters (formerly Eurocopter) models EC135T/P3E, EC145T2, EC175 and X4. 1. Think outside your peer group, what is really best for you, your family and the yacht? Don’t underestimate the value of good, professional advice. 2. Do not overlook the second-hand market, there are real bargains to be had in the VIP sector. 3. Fixed provisions for mission equipment you may not need, could make the difference when you come to sell it. 4. Seek out the best customer service and after-sales support you can find. 5. On the day you sign the purchase contract, visualise the day you will sell the helicopter. Ensure they are both happy days thanks to the care you took during the purchasing process. Please click on the link below to read a PDF of the full article, kindly shared with us by Asia Pacific Boating magazine.